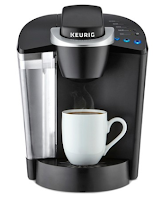 Right now you can score this Keurig K50 Coffee Maker Brewing System in either red or black for only $79.99 from Target.com! Use promo code HOLIDAY for 10% off and pair it with coupon code HIDETGAX34GD for $5 off to lower the price to only $66.99. To make this deal even sweeter, you'll get a FREE $15 Target Gift Card AND a FREE $20 Target Gift Card when you buy this Keurig. This makes the final price ONLY $31.99 after you factor in the gift cards!